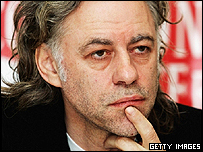 Bob Geldof is set to announce three more Live 8 concerts, including one to be held in Africa. Live 8 Africa will take place in Johannesburg, while concerts will also be staged in Tokyo and Toronto. The venues will add to a growing list of shows that includes London, Philadelphia, Paris, Rome, Berlin and Cornwall on 2 July. They aim to highlight world poverty and will take place days before the G8 summit of world leaders at Gleneagles. Geldof said he hoped former South African president Nelson Mandela - who has also campaigned for the alleviation of poverty in Africa - would head the Live 8 Africa concert. "Mandela, if he's well enough, will bring it to the world," he said. Geldof, who originally co-ordinated five main concerts in Europe and the US, said he decided to arrange more after the European Union agreed to double its development aid to poorer nations. He said: "Three weeks ago Europe agreed, unbelievably, to double aid, throwing the ball back to the Yanks, the Japanese and the Canadians. "So that forced me now to do, which I didn't want to do, a concert in Tokyo, Toronto, which we are announcing tomorrow [Friday] . "We will also announce Johannesburg tomorrow." Geldof also said that people without tickets will be allowed into Hyde Park on the day of the show, reportedly to watch the concert with extra screens and speakers. "I'm not supposed to talk about this but other people tell me there are arrangements to allow hundreds of thousands more into the park on the day," he said. He added that there would not be another gig like Live 8 in anyone's lifetime. "You have the originals, their children, their grandchildren, their great grandchildren. They will never be on a stage together again. Meanwhile, rockers Status Quo have said they are "desperate" to join the bill at the London gig in Hyde Park. Status Quo famously opened the original Live Aid concert in 1985 with their hit Rockin' All Over The World. Roxy Music have joined the bill for the Live 8 concert in Berlin. They will join Green Day, Tracy Chapman, Brian Wilson, Chris de Burgh and Welsh opera star Katherine Jenkins at the concert at the Brandenburg Gate.